January 2012International Medcom, Inc. 707-823-0336 www.medcom.com How to Use the Inspector Alert. 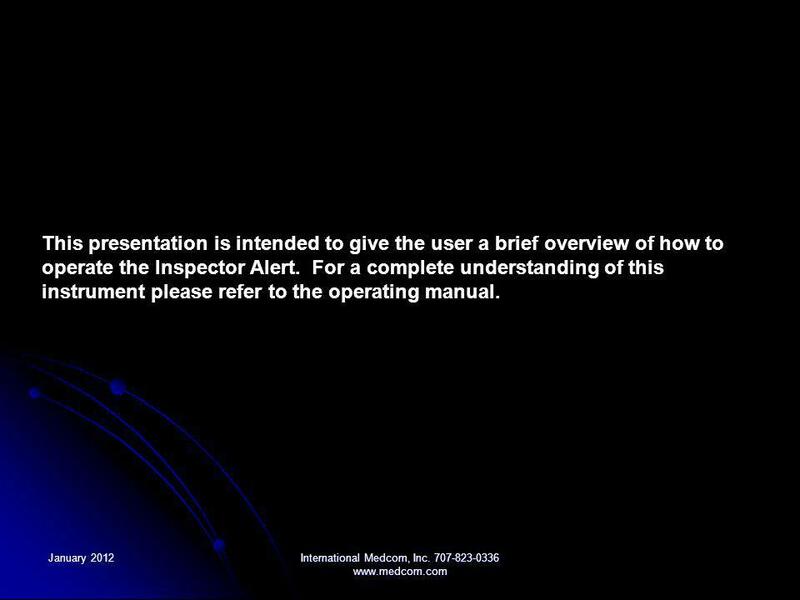 2 January 2012International Medcom, Inc. 707-823-0336 www.medcom.com This presentation is intended to give the user a brief overview of how to operate the Inspector Alert. For a complete understanding of this instrument please refer to the operating manual. 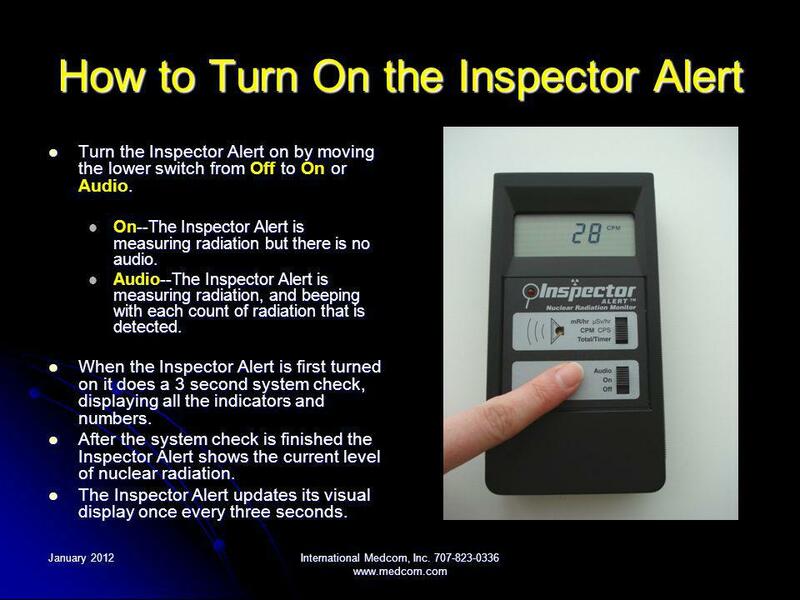 4 January 2012International Medcom, Inc. 707-823-0336 www.medcom.com How to Turn On the Inspector Alert Turn the Inspector Alert on by moving the lower switch from to or. Turn the Inspector Alert on by moving the lower switch from Off to On or Audio. 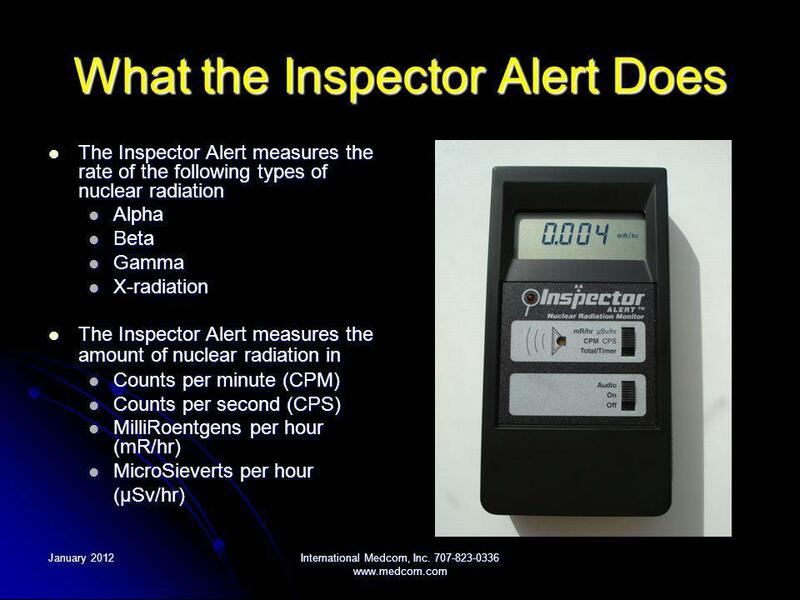 --The Inspector Alert is measuring radiation but there is no audio. On--The Inspector Alert is measuring radiation but there is no audio. --The Inspector Alert is measuring radiation, and beeping with each count of radiation that is detected. Audio--The Inspector Alert is measuring radiation, and beeping with each count of radiation that is detected. When the Inspector Alert is first turned on it does a 3 second system check, displaying all the indicators and numbers. When the Inspector Alert is first turned on it does a 3 second system check, displaying all the indicators and numbers. After the system check is finished the Inspector Alert shows the current level of nuclear radiation. After the system check is finished the Inspector Alert shows the current level of nuclear radiation. The Inspector Alert updates its visual display once every three seconds. The Inspector Alert updates its visual display once every three seconds. 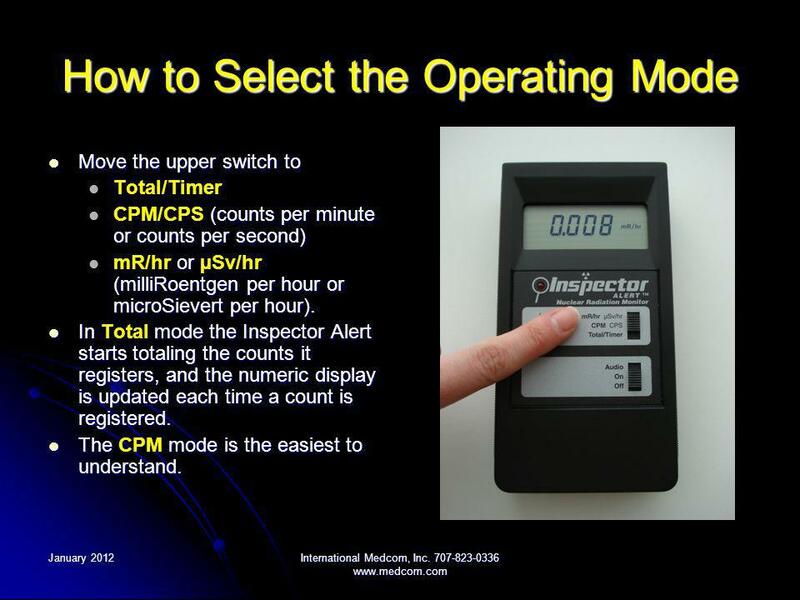 5 January 2012International Medcom, Inc. 707-823-0336 www.medcom.com How to Select the Operating Mode Move the upper switch to Move the upper switch to Total/Timer (counts per minute or counts per second) CPM/CPS (counts per minute or counts per second) or (milliRoentgen per hour or microSievert per hour). mR/hr or µSv/hr (milliRoentgen per hour or microSievert per hour). In mode the Inspector Alert starts totaling the counts it registers, and the numeric display is updated each time a count is registered. In Total mode the Inspector Alert starts totaling the counts it registers, and the numeric display is updated each time a count is registered. The mode is the easiest to understand. The CPM mode is the easiest to understand. 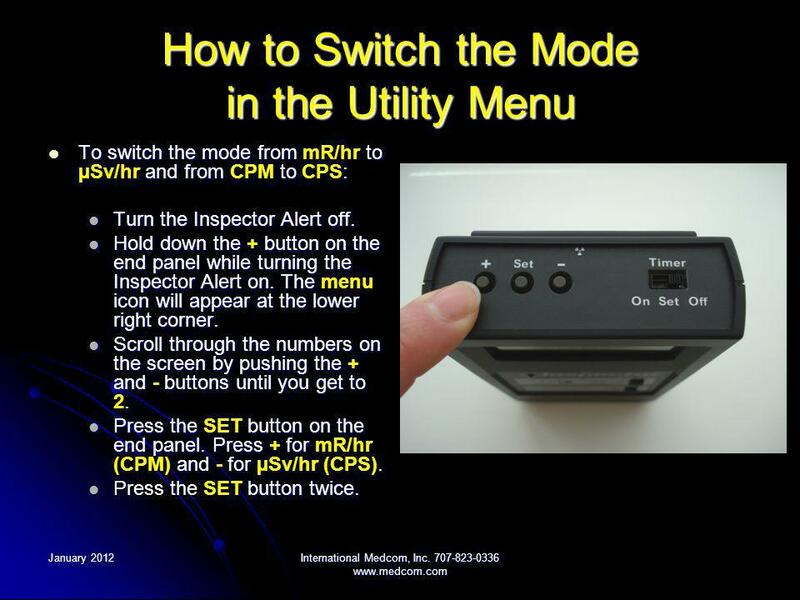 6 January 2012International Medcom, Inc. 707-823-0336 www.medcom.com How to Switch the Mode in the Utility Menu To switch the mode from to and from to : To switch the mode from mR/hr to µSv/hr and from CPM to CPS: Turn the Inspector Alert off. Turn the Inspector Alert off. Hold down the button on the end panel while turning the Inspector Alert on. The icon will appear at the lower right corner. Hold down the + button on the end panel while turning the Inspector Alert on. The menu icon will appear at the lower right corner. Scroll through the numbers on the screen by pushing the and buttons until you get to. Scroll through the numbers on the screen by pushing the + and - buttons until you get to 2. Press the button on the end panel. Press for and for Press the SET button on the end panel. Press + for mR/hr (CPM) and - for µSv/hr (CPS). button twice. Press the SET button twice. 7 January 2012International Medcom, Inc. 707-823-0336 www.medcom.com What is Background Count? The background count is the normal level of nuclear radiation that is occurring at a given time and place. The background count is the normal level of nuclear radiation that is occurring at a given time and place. Some sources of background radiation are: Some sources of background radiation are: The sun The sun Minerals in the earth Minerals in the earth Residual radiation from nuclear testing and other man made sources Residual radiation from nuclear testing and other man made sources Nuclear radiation is a naturally occurring phenomenon. When the Inspector Alert is on it is normally measuring the background count. Nuclear radiation is a naturally occurring phenomenon. When the Inspector Alert is on it is normally measuring the background count. 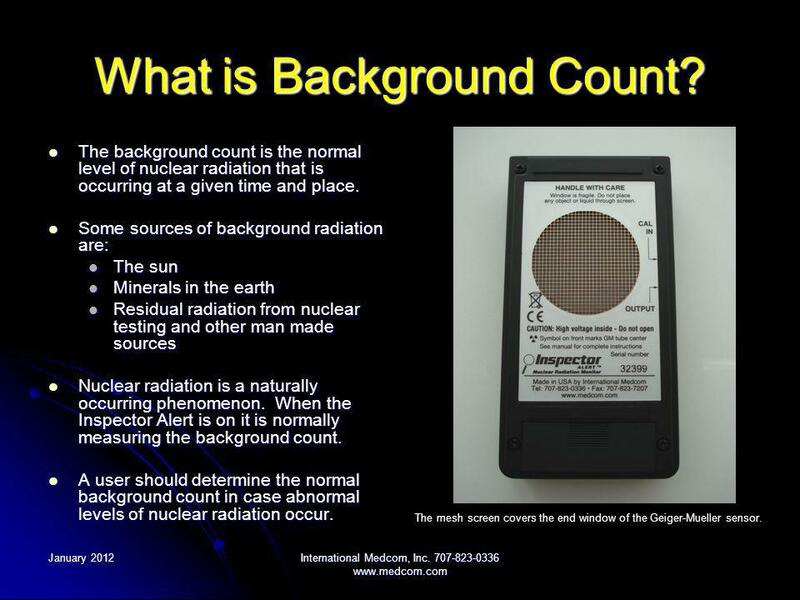 A user should determine the normal background count in case abnormal levels of nuclear radiation occur. A user should determine the normal background count in case abnormal levels of nuclear radiation occur. The mesh screen covers the end window of the Geiger-Mueller sensor. 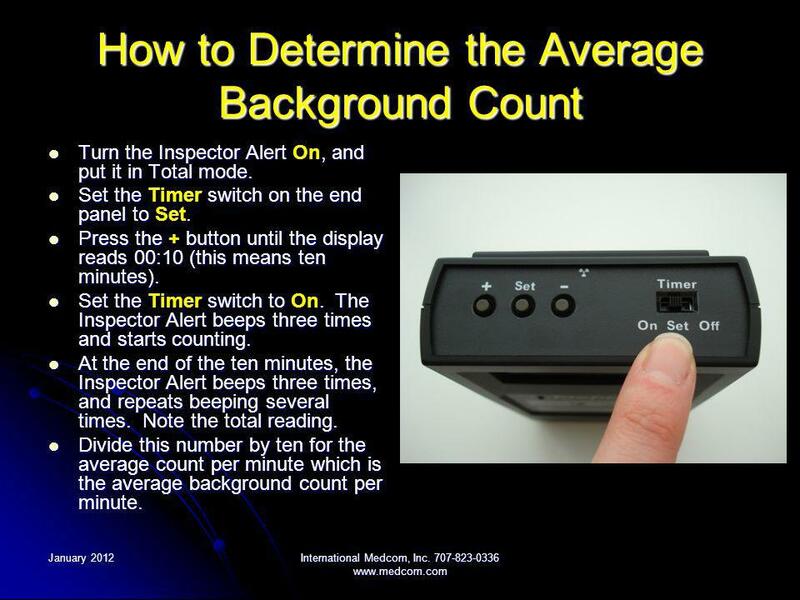 8 January 2012International Medcom, Inc. 707-823-0336 www.medcom.com How to Determine the Average Background Count Turn the Inspector Alert, and put it in Total mode. Turn the Inspector Alert On, and put it in Total mode. Set the switch on the end panel to. Set the Timer switch on the end panel to Set. Press the button until the display reads 00:10 (this means ten minutes). Press the + button until the display reads 00:10 (this means ten minutes). Set the switch to. The Inspector Alert beeps three times and starts counting. Set the Timer switch to On. The Inspector Alert beeps three times and starts counting. At the end of the ten minutes, the Inspector Alert beeps three times, and repeats beeping several times. Note the total reading. At the end of the ten minutes, the Inspector Alert beeps three times, and repeats beeping several times. Note the total reading. Divide this number by ten for the average count per minute which is the average background count per minute. Divide this number by ten for the average count per minute which is the average background count per minute. 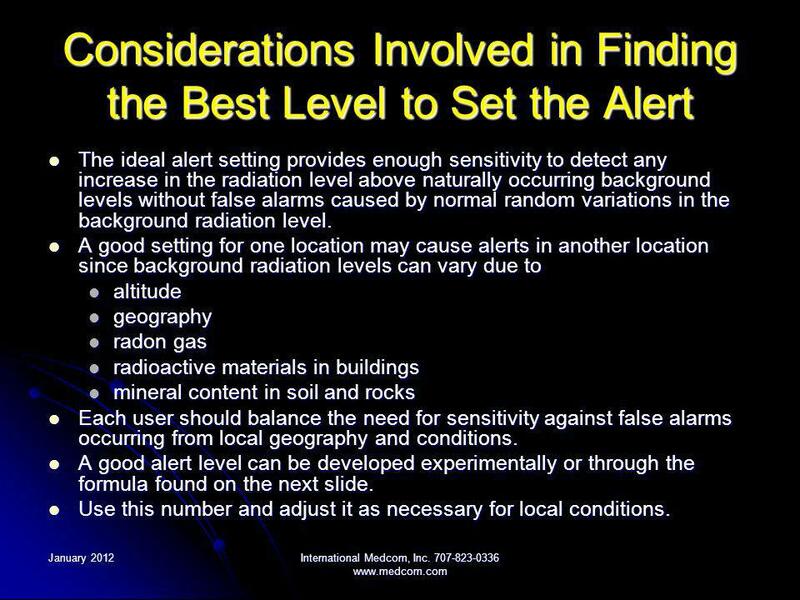 9 January 2012International Medcom, Inc. 707-823-0336 www.medcom.com Considerations Involved in Finding the Best Level to Set the Alert The ideal alert setting provides enough sensitivity to detect any increase in the radiation level above naturally occurring background levels without false alarms caused by normal random variations in the background radiation level. The ideal alert setting provides enough sensitivity to detect any increase in the radiation level above naturally occurring background levels without false alarms caused by normal random variations in the background radiation level. A good setting for one location may cause alerts in another location since background radiation levels can vary due to A good setting for one location may cause alerts in another location since background radiation levels can vary due to altitude altitude geography geography radon gas radon gas radioactive materials in buildings radioactive materials in buildings mineral content in soil and rocks mineral content in soil and rocks Each user should balance the need for sensitivity against false alarms occurring from local geography and conditions. Each user should balance the need for sensitivity against false alarms occurring from local geography and conditions. A good alert level can be developed experimentally or through the formula found on the next slide. A good alert level can be developed experimentally or through the formula found on the next slide. Use this number and adjust it as necessary for local conditions. Use this number and adjust it as necessary for local conditions. 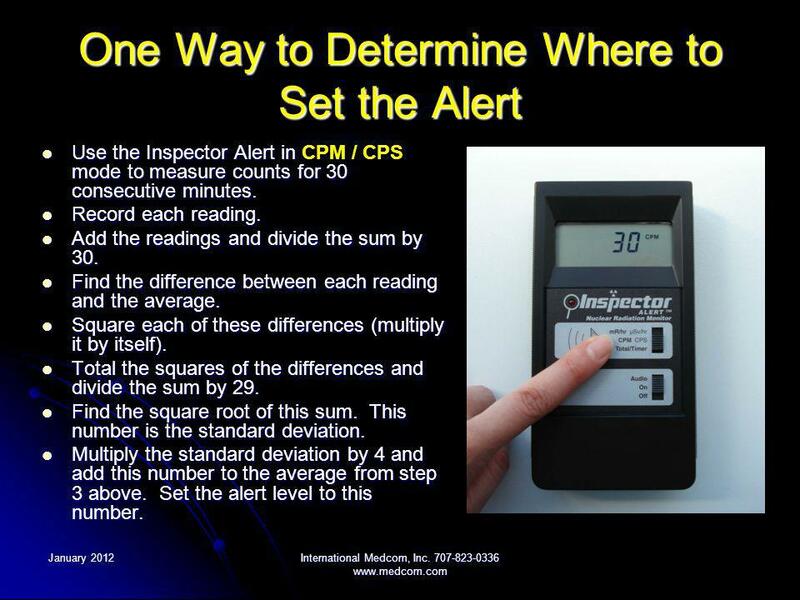 10 January 2012International Medcom, Inc. 707-823-0336 www.medcom.com One Way to Determine Where to Set the Alert Use the Inspector Alert in mode to measure counts for 30 consecutive minutes. Use the Inspector Alert in CPM / CPS mode to measure counts for 30 consecutive minutes. Record each reading. Record each reading. Add the readings and divide the sum by 30. Add the readings and divide the sum by 30. Find the difference between each reading and the average. Find the difference between each reading and the average. Square each of these differences (multiply it by itself). Square each of these differences (multiply it by itself). Total the squares of the differences and divide the sum by 29. Total the squares of the differences and divide the sum by 29. Find the square root of this sum. This number is the standard deviation. Find the square root of this sum. This number is the standard deviation. Multiply the standard deviation by 4 and add this number to the average from step 3 above. Set the alert level to this number. Multiply the standard deviation by 4 and add this number to the average from step 3 above. Set the alert level to this number. 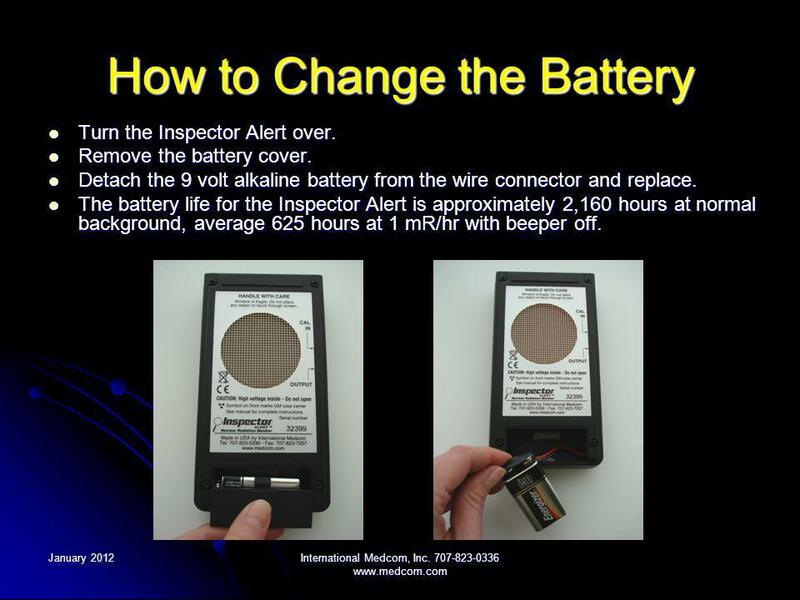 11 January 2012International Medcom, Inc. 707-823-0336 www.medcom.com How to Change the Battery Turn the Inspector Alert over. Turn the Inspector Alert over. Remove the battery cover. Remove the battery cover. Detach the 9 volt alkaline battery from the wire connector and replace. Detach the 9 volt alkaline battery from the wire connector and replace. The battery life for the Inspector Alert is approximately 2,160 hours at normal background, average 625 hours at 1 mR/hr with beeper off. The battery life for the Inspector Alert is approximately 2,160 hours at normal background, average 625 hours at 1 mR/hr with beeper off. 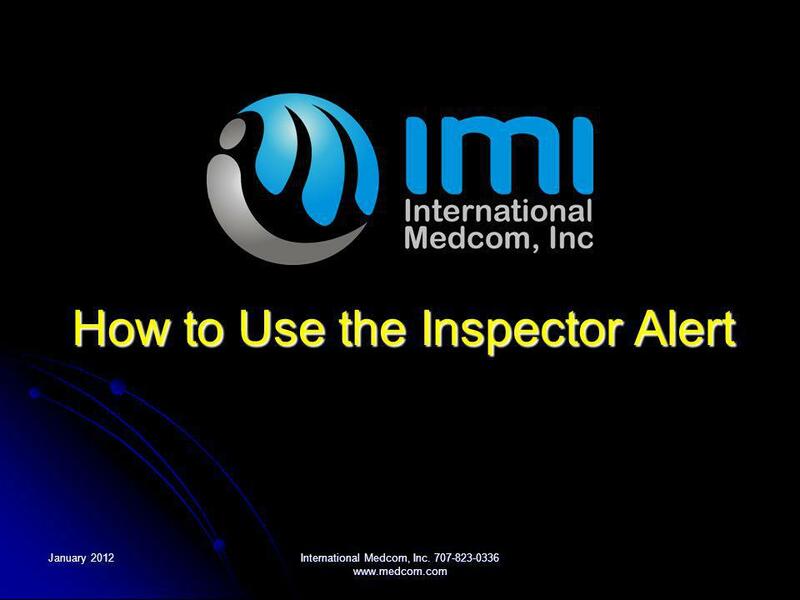 Download ppt "January 2012International Medcom, Inc. 707-823-0336 www.medcom.com How to Use the Inspector Alert." January 2012International Medcom, Inc How to Use the Radalert 100. Setting Up Groups in D2L Emily Evans, Center for Applied Linguistics January 2007 New Jersey Department of Education Developed by the Center for Applied. Previously… We created a simulated temperature reader which alerts if too hot or too cold… Download the solved practice to keep in sync: Thermostat.vi. First Previous HomeNextLast LAURUS Systems | Ph: (410) | Fax: (410) Personal Radiation Detector. SECTION 11 LEVEL B SUIT OUT. SECTION 12 AIR MONITORING. SOLARIS 3-GAS METER Complete operation of Solaris multi-gas meter can be found on the LAFD Ethernet. When the Easy Fridge/Freezer Alarm is plugged into the wall it will ‘boot up’ and display the System Setup Menu Parameter menu will appear where you will. MATRIX REPORTER HYPACK & DREDGEPACK Purpose of the MATRIX REPORTER To provide a quick report of progress in any dredging environment. To allow the. Congratulations! You have just installed the Presentation Game Add-In. M40M Multi-Gas Monitor. Checking instrument: A. Checking instrument: 1.Turn the instrument on by pressing the power button on the control face panel for.